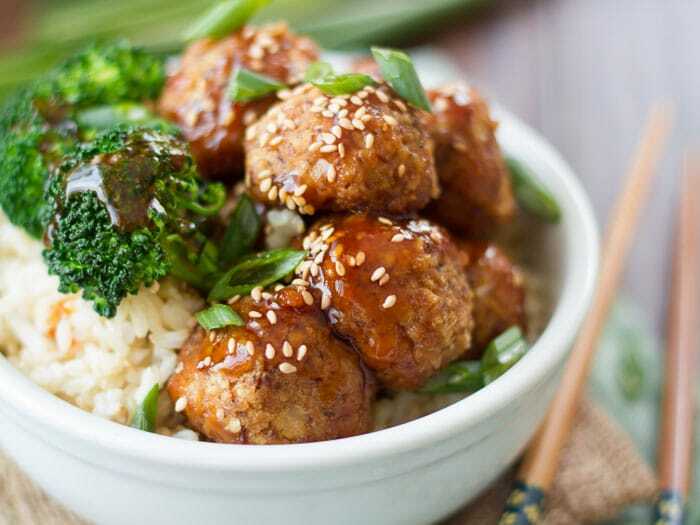 These shittake mushroom and tofu meatballs are flavored with savory seasonings and drenched in a sticky ginger glaze. Serve them up as a fun party appetizer, or add some rice and veggies for a flavor-packed meal. My thinking was a bit circular on this one. See, I post lots of veggie + rice based Asian-inspired dishes, and more often than not, I throw in some tofu for protein. I love tofu! (In case you haven’t noticed.) But I thought it was time to mix things up. Meatballs would be cool. 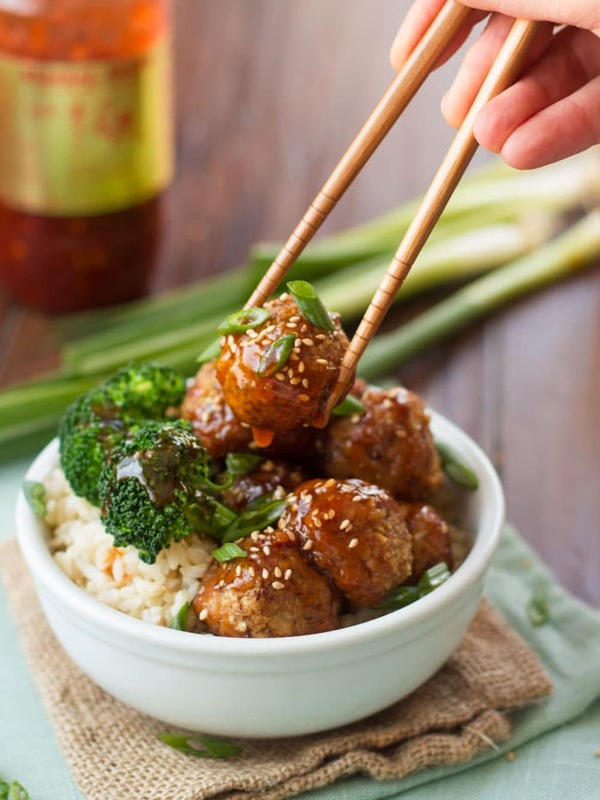 I see all kinds of meatball Asian dishes on Pinterest and such. I should create a vegan one. The question arose, what would I make these meatballs out of? I usually make my meatballs out of beans. Should I try something different? Is it weird to throw beans into Asian dishes like this? (More on this topic to come.) How about tofu? Tofu goes great in Asian dishes! And so, we ended up with tofu meatballs. I’ll be honest, I wasn’t sure if this was going to work, but I loved them! These meatballs were just as tasty as any bean ball I’ve tried, but also had the lightness of tofu. They were perfect served in bowls with some roasted broccoli and rice. (Tip: make these a meal by roast some veggies in the oven while your meatballs are cooking.) They’d be just as perfect served up for snacking with some cute little toothpicks. Preheat oven to 375°. Like a couple of baking sheets with parchment and brush lightly with oil. Place tofu, mushrooms, onion, garlic, panko, milk, soy sauce, flaxseed, liquid smoke and pepper into food processor bowl. Pulse until well mixed and crumbly, stopping to scrape down sides of bowl as needed. Roll into about 20 balls and arrange on baking sheet. Brush with oil. Bake 30 minutes, turning about halfway through. While meatballs bake, stir chilled water and cornstarch together in a small cup. Place soy sauce, vinegar, maple syrup, sesame oil and ginger into a small pot. Bring just to a simmer, and stir in cornstarch mixture. Continue to simmer, stirring, just until mixture thickens, about 1 minute. Remove from heat. 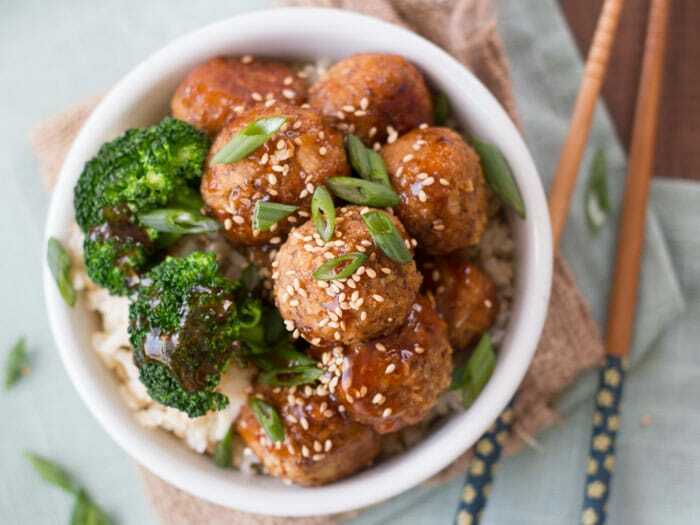 Pour glaze over meatballs and sprinkle with sesame seeds and scallions. Serve with rice and/or veggies, if desired. The meatballs firm up a bit as they cool. They were awesome right out of the oven, but I actually preferred eating the reheated leftovers a few hours later. Nutritional information does not include accompaniments. Could I substitute another kind of mushroom? Shiitake just aren’t my thing. I think most types of mushrooms would work just fine. White button mushrooms are probably a safe bet. Enjoy! can the flaxseed be subsituted for an egg? Or is it used for another purpose? It is in there as a binder. If you use an egg instead you might want to just cut back on the other liquid – maybe leave out the milk altogether. Where can I find liquid smoke? Or is there a substitution? Most supermarkets carry liquid smoke near the barbecue sauces. I’ve also included a link to where you can buy it on Amazon. It’s not absolutely necessary, but does give them a nice flavor. You could try a little smoked paprika if you can’t get your hands on liquid smoke. Enjoy!! Is it just me or you missed adding the freshly grated ginger in your procedure in making the glaze? Great recipe! I made these with ‘Swiss Brown’ mushrooms as that was all that was available. Oh and no liquid smoke so subbed a 1/2 tsp of smokey paprika, and a dash of chipotle sauce. They worked out just fine – in fact were delicious! I increased the glaze by 1.5 as i like a lot of sauce and think as a main they would have been a tad dry on rice otherwise. As a snack on a stick probably the sauce amount would be fine. Do you think spare mixture would freeze ok? I was running out of time so as soon as I had enough tofu balls made for dinner I abandoned the rest of the mix into the fridge. Or would I be better cooking them and then freezing? Glad you enjoyed them! I had a question come in about subbing different mushrooms, so I’m glad to hear that worked out! I think your best bet would be to freeze the mix, but I’ll have to give it a try next time I make them. Tofu gets more crumbly when you freeze it, so I think if you cooked them first I feel like they might fall apart. yum! I made with ordinary mushrooms and apple cider vinegar instead of rice vinegar, and honey instead of maple syrup (reflecting what I had in the cupboard). I also totally omitted the flax seeds for the same reason – didn’t realise what it was for, could try egg replacer next time I guess. I’m in Australia so perhaps our liquid smoke is stronger… but 1 tsp was way too much and overpowered it all, giving a distinct bitterness I’ve had when I’ve overdone it before. I’ll try ¼ tsp next time. Or maybe try the smoked paprika idea. I also agree with the sauce – I used a bit more on veggies and rice so will make more next time! Thanks for a yummy new recipe. Hi, what can I substitute for the mushroom? I do t eat mushrooms. Thanks. I don’t care for tofu but had some in the fridge from a vegetarian friend’s weekend visit. Decided to give these a try…delicious! BTW a couple of tweaks… I didn’t have flax seed, just used one egg white and no milk…consistency was perfect. Also substituted Worcestershire sauce for the liquid smoke. Double the glaze…you’ll want more! looks delicious! I don’t have an oven at home, is there any other way I could cook the meatballs? Hi do you still reply to this feed ..?.. If so what substitutes could I use for instead of panko bread crumbs and cornstarch ..?.. Try out flour (or just grinding up some oats in the food processor) in place of the panko. You might need to use a bit less though – try 1 cup. And arrowroot should work in place of cornstarch. Enjoy! For anyone who is curious, I reluctantly made these with my vitamix because my food processor is broken (with a new part on the way) and I couldn’t wait to try them. They obviously went right past the crumbly stage to the “puréed” stage in the blender. I added some extra tofu and extra panko and it seemed to help, and then I also chilled them for a few hours before putting them into the oven. I’m sure the texture was off a little, but they were still super flavorful and delicious.The sauce was amazing- we paired our balls with noodles and veggies, so I doubled the sauce like most people. Alissa, once my food processor is back in business, these will be a regular in our house! And the sauce I’m totes going to make and put on other things- cauli wings, anyone?!!! This sauce would be so good on cauliflower wings!! I’m so glad you enjoyed these! Thanks Kaitlan! I just made these and they are UNREAL!!!!! i didnt have cornstarch so i just mixed flour and water to thicken it and it still turned out amazing. Yay!! I’m so glad you enjoyed them! Thanks Natalie! I don’t have a food processor at home but I have a hand blender… would that work to mix and blend the ingredients?? Or can i just use my hands? I think you could do it by hand if everything is chopped up really fine. Enjoy!